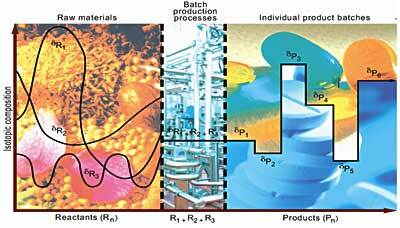 The concepts of pharmaceutical product and process authenticity are summarized in the next two figures. The first figure below, summarizing the concept of pharmaceutical product authenticity illustrates how the isotopic compositions in plants and natural materials (“raw materials”) may vary widely in time and space, but that they are both chemically- and isotopically homogenized in batch production processes. With each ~500-kg batch of pharmaceutical material containing sufficient material for ~1-million tablets, each individual batch is composed of isotopically-homogeneous material that can subsequently be isotopically traced for its authenticity – to mitigate counterfeiting, countertrading, illegal reimportation, theft, vicarious liability, and patent infringement. These topics are covered in a summary article (Jasper, 2004). The problems of pharmaceutical Product and Process Counterfeiting are illustrated here. The power of natural stable isotopes in differentiating specific manufacturing-sources is shown in the figure below. In this blind study, performed in cooperation with the US Food and Drug Administration Division of Pharmaceutical Analysis (FDA-DPA) in St. Louis. Missouri, USA, twenty-six samples of Naproxen from six manufacturers in four countries were isotopically examined. 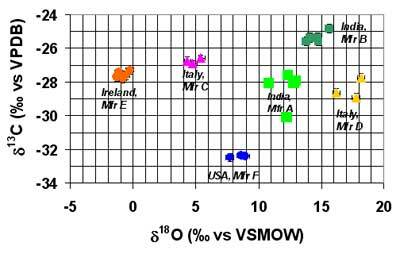 In this case, two isotopic ratios (carbon-13 and oxygen-18) permitted clear differentiation of their sources. For the full report, see Wokovich et al. (2005). MIT LLC has observed similar clear results for other clients products as well.